Modernize the look and feel of any room you love with our expansive selection of quality tile flooring in Springdale, AR. Bring in your design plan and any samples you may have, and let our friendly sales associated help you find the right color and texture of ceramic and porcelain tile. When you are ready to replace the word and scratched floors you have been living with for too long, we are ready to help you find the best fit for your home and home décor. Create a tile floor that is capable of withstanding the daily traffic that comes with having a busy family with kids and pets. We understand that you have a specific budget to work with, and you need value with every dollar you spend. Our design specialists take the time to listen to your needs, so you get a beautiful floor you can be proud of. Cover more of your floor than you ever thought possible with a visit to our showroom. Our association with a national retail flooring group means we are able to pass on a serious level of savings to our local customers. 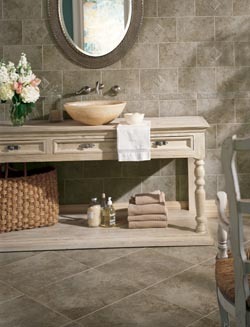 A new tile floor can make a big impact with any neighbors and guests you invite into your home. Each and every home is unique in its own way, and that is what makes choosing the right team for tile flooring installation so important. With our competitive pricing and experienced installation team, there is no limit to the possibilities in your home. We understand that a new tile floor is a serious investment for any homeowner, and you need to be assured that you are getting the right look for the right price. That is why we provide you with our 5 Star Selection System and our Ultimate Confidence Guarantee. We are interested in building a lasting relationship with you and your family. That begins with personalized service and honest pricing on every product we sell. Protect the investment you are making in new home flooring by choosing our team for professional tile flooring installation. Every home is different, and each variety of tile flooring presents differing installation challenges. Our team is equipped with the most advanced tools and a broad variety of pattern ideas to choose from. Instead of guessing your way through this process and wasting too much flooring in the process, get the best fit possible from a trained team of flooring professionals. Our commitment to customer satisfaction means we are with you at every step of your design journey. Make the most of your current living space, and boost the resale value of your home, with a visit to our showroom. Your home can become the place you always dreamed of without spending a fortune in the process. Contact us for a free room measurement and estimate on the price of new tile flooring for your home. We proudly serve customers in Springdale, Fayetteville, Lowell, Cave Spring, and Siloam Springs, Arkansas, and surrounding communities.